In the days of His flesh (cp Heb 2:14) - The writer again emphasizes the reality of our Lord's humanity and His participation in all the experiences of His people, which makes Him fit for having compassion on those for whom He mediates. Flesh (4561)(sarx) in this context clearly does not refer to the fallen sin nature but signifies Christ's human nature not yet glorified, a nature with all its infirmities to which He was exposed such as hunger, thirst, weariness, labor, sorrow, grief, fear, pain, death itself. As Ironside says "He trod the path of faith and took the place of dependence on the Father." The writer now explains how in a sense Christ was under training for the priesthood, and thus he proceeds to describe the process of training. Hughes makes the point that "throughout this time on earth it was the custom of the incarnate Son to maintain fellowship with and to express his dependence on the Father by means of prayer and supplication (see Mk. 1:35; 6:46; Lk. 5:16; 6:12; Jn. 17:1ff., etc.). Phil Newton - Our writer gives us a picture of the humanity of God the Son as He faithfully exercised His divinely appointed office of High Priest. In seeing Christ bearing the emblems of His mediatorial office the struggling believer can find new courage to press on in the face of trials, persecution, and even doubts. Paul reminds us concerning Christ, "Who, although He existed in the form of God, did not regard equality with God a thing to be grasped, but emptied Himself, taking the form of a bond-servant, and being made in the likeness of men" (Phil 2:6, 7). As man Jesus Christ was not less than God. He remained God throughout His earthly pilgrimage. Yet, to use J. B. Phillips translation, "For he, who had always been God by nature, did not cling to his prerogatives as God's equal, but stripped himself of all privilege by consenting to be a slave by nature and being born as mortal man." Jesus Christ lived as a Man-for that is exactly what He was (and is!). The identification of Jesus, our high priest, with us: He prayed and learned obedience through what He suffered (He 5:7-8). These verses elaborate on He 4:15, that Jesus can sympathize with our weaknesses because He has been tempted in all things as we are, yet without sin. Similar to the Levitical priests, Jesus could identify with the weaknesses of the people. But, unlike these priests, He had no sin of His own. 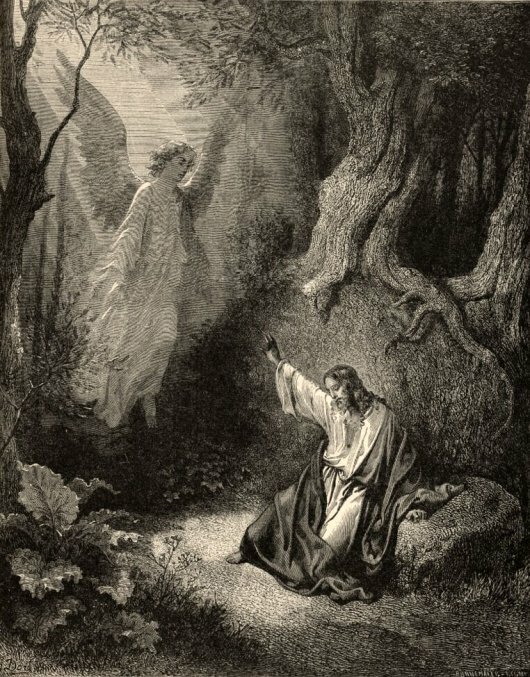 “In the days of His flesh” refers to Jesus’ earthly life, but He 5:7 especially points to Jesus’ agony in the Garden of Gethsemane as He wrestled with the imminent prospect of taking our sins upon Himself. Jesus’ intense struggle in the Garden was not just over the thought of the physical agony of crucifixion. of being separated from the Father as He bore our sin. This was so intense that He literally sweat blood. None of the gospel accounts report Jesus’ “loud crying and tears,” but this information probably came directly from one of the apostles who were present. It shows us that even though Jesus is fully God, and the cross was central to God’s predetermined plan (Acts 2:23; 4:27,28), the actual implementation of that plan was not easy. It was not just playacting a role! Jesus’ suffering in the Garden and on the cross was more intense than we can ever imagine, because we do not know what it was like to be one with the Father from all eternity until that dreadful hour. Prosphero - 47x in 45v in NAS - Matt 2:11; 4:24; 5:23f; 8:4, 16; 9:2, 32; 12:22; 14:35; 17:16; 18:24; 19:13; 22:19; 25:20; Mark 1:44; 2:4; 10:13; Luke 5:14; 18:15; 23:14, 36; John 16:2; 19:29; Acts 7:42; 8:18; 21:26; Heb 5:1, 3, 7; 8:3, 4; 9:7, 9, 14, 25, 28; 10:1, 2, 8, 11,12; 11:4, 17; 12:7. NAS = bringing(2), brought(12), deals(1), get(1), make an offering(1), offer(8), offered(12), offering(4), offers(1), present(2), presented(1), presenting(1). Prayers (1162) (deesis [word study]) refers to urgent requests or supplications to meet a need and are exclusively addressed to God. Deesis refers to special, definite requests. Deesis in the New Testament always carries the idea of genuine entreaty and supplication before God. It implies a realization of need and a petition for its supply. Deesis was used by the angel who assured the godly father of John the Baptist, "Do not be afraid (command to stop fearing indicating he already was fearful), Zacharias (means "Jehovah remembers"), for your petition (deesis - specifically their need for God to open his wife's womb) has been heard, and your wife Elizabeth (means "my God is an oath") will bear you a son, and you will give him the name John (means “Jehovah has shown grace”)” (Luke 1:13). Luke uses deesis again of the disciples of John the Baptist, who were said to “often fast and offer prayers (deesis)" (Luke 5:33). Deesis was used by Paul of his fervent prayer for the salvation of his fellow Israelites "Brethren, my heart's (deepest, consuming) desire and my prayer prayer (deesis - conveys idea of pleading and entreaty, of persistent petition) to God for them is for their salvation. (Ro 10:1-note). Supplications (2428) (hiketería [sole occurrence of this noun in the NT] form hiketes = a suppliant from hiko = to come to one) originally described an olive branch entwined with wood carried by a suppliant. In the Greek culture the suppliant would hold and wave to express their desperate prayer and desire. The idea then came to mean that which is being urgently requested by someone, in this case the God-Man! What a powerful picture of the depth of Christ's humility and the profundity of His prayers! We get a sense of this in Luke's description of our Lord in Gethsemane the night before He went to the cross, praying so intensely that His sweat was like drops of blood. His heart was broken at the prospect of bearing sin. Note that our Lord neither was saved from death nor did He ever pray to be saved from such. Furthermore He did He fear death as some teach. His mission as the Son of God was to enter our world and die. And yet what a testimony these tears provide regarding the reality of His manhood! Spurgeon on with crying - This is to prove His infinite sympathy with His people, and how He was compassed with infirmity. Christ prayed. How near He comes to you and to me by this praying in an agony, even to a bloody sweat, with strong crying, and with weeping! Some of you know what that means, but it did, perhaps, seem to you that Christ could not know how to pray just so; yet He did. In the days of His flesh, He not only offered up prayer, but “prayers and supplications”—many of them, of different forms, and in different shapes—and these were accompanied with “strong crying and tears.” Possibly you have sometimes had a dread of death; so had your Lord—not a sinful fear of it, but that natural and perfectly innocent, yet very terrible dread that comes to a greater or less extent upon every living creature when in expectation of death. Jesus also comes very near to us because He was not literally heard and answered. He said, “If it is possible, let this cup pass from me” (Matt 26:39). But the cup did not pass from Him. The better part of His prayer won the victory, and that was, “Nevertheless, not as I will, but as you will.” You will be heard, too, if that is always the principal clause in your prayers; but you may not be heard by being delivered from the trouble. Even the prayer of faith is not always literally heard. God, sometimes, instead of taking away the sickness or the death, gives us grace that we may profit by the sickness, or that we may triumph in the hour of death. That is better than being literally heard; but even the most believing prayer may not meet with a literal answer. He “was heard as a result of His reverence”; yet He died, and you and I, in praying for ourselves, and praying for our friends, may pray an acceptable prayer, and be heard, yet they may die, or we may die. Crying (2906) (krauge from krazo = to croak or cry) is a cry which a man does not choose to utter but is wrung from him in the stress of some tremendous tension or searing pain. Krauge is an onomatopoeic word, imitating the raven’s cry. It describes a crying, screaming, shrieking, shouting, Lat. clamor. The idea is a crying out as with a sharp cry or even a shout, as when one cries out in surprise (Mt 25:6), in support (Acts 23:9), in unrestrained brawling (Eph 4:31). In the present context this word pictures Jesus crying out loudly to God in prayer during His time of trial. Krauge - 6x in 6v in NAS - Matt 25:6; Luke 1:42; Acts 23:9; Eph 4:31; Heb 5:7; Rev 21:4. NAS = clamor(1), crying(2), shout(1), uproar(1), voice(1). The rabbis wrote that "There are three kinds of prayers, each loftier than the preceding-prayer, crying and tears. Prayer is made in silence; crying with raised voice; but tears overcome all things. Hence the terrible cry of dereliction from the cross: "My God, my God, why hast thou forsaken me?" (Mk. 15:34). In a real but deeply mysterious manner, which no words of man can explain, the incarnate Son as he hung on the cross endured the desolating anguish of being torn away from his Father. He took our sins, the sins of the whole world (1Jn 2:2), upon himself at Calvary in order that there he might bear our judgment, the Righteous for the unrighteous (1Pe 2:24-note; 1Pe 3:18-note). It was then, on that cross, that "God made him who knew no sin to be sin for our sake, so that in him we might become the righteousness of God" (2Co 5:21). For this reason the second death has no power over those who by faith are one with Him Who as our Sin-Bearer endured the second death in our place; and for them the first death, which is the death of the body, holds no terror because the bodily resurrection of Jesus is the guarantee that they too will rise to everlasting life (1Co 15:20; 2Co 4:14). The dread with which he approached the cross is explained, as Calvin says, by the fact that in the death that awaited him "he saw the curse of God and the necessity to wrestle with the total sum of human guilt and with the very powers of darkness themselves." To the One able to save - Referring to God the Father. As Spurgeon says - The expression is startling; the Savior prayed to be saved. In His direst woe He prayed thoughtfully, and with a clear apprehension of the character of Him to whom He prayed. It is a great help in devotion to pray intelligently, knowing well the character of God to whom you are speaking. Jesus was about to die, and therefore the aspect under which He viewed the great Father was as “the one who was able to save him from death.” This passage may be read in two ways: it may mean that He would be saved from actually dying if it could be done consistently with the glorifying of the Father; or it may mean that He pleaded to be saved out of death, though He actually descended into it. The word may be rendered either from or out of. The Savior viewed the great Father as able to preserve Him in death from the power of death, so that He should triumph on the cross, and also as able to bring Him up again from among the dead. Remember how He said in the psalm: “You will not abandon my soul to Sheol; you will not give your faithful one to see the grave” (Psa 16:10). Jesus had faith in God concerning death, and prayed according to that faith. This brings our blessed Lord very near to us; He prayed in faith even as we do. He believed in the power of God to save Him from death, and even when cast down with fear He did not let go His hold on God. He pleaded just as you and I should plead, impelled by fear and encouraged by faith. Able (1410) (dunamai [word study]) means to be (present tense = continuously) able to, capable of, and strong enough to save Him form death. Save (4982)(sozo [word study]) means the Father could (present tense = continuously) rescue Jesus from Death, the great enemy of mortal men (1Co 15:26, 54, 55, 56, 57). Additional nuances of sozo include to protect, keep alive, preserve life, deliver, heal, be made whole. Guzik asks an interesting question - If Jesus asked that the cup be taken away from Him (Luke 22:42), and the cup was not taken away, how can it be said that He was heard? Because His prayer was not to escape His Father’s will, but to accept it - and that prayer was definitely heard. Spurgeon - To think that it should be said of your Lord that He was heard, even as you, a poor suppliant, are heard. Yet the cup did not pass from Him, neither was the bitterness thereof in the least abated. When we are compelled to bear our thorn in the flesh and receive no other answer than “My grace is sufficient for you” (2 Cor 12:9), let us see our fellowship with Jesus and Jesus’ fellowship with us. Because of His piety - He was heard on account of His good acceptance of what He was accomplishing as the High Priest. Piety (2124) (eulabeia from eulabes = careful as to the realization of the presence and claims of God, reverencing God, pious, devout from eu = good, well, right + lambano = take hold ~ taking hold well) in the original Greek usage meant caution, circumspection, discretion and then reverence or veneration. The Lxx usage in Joshua conveys the idea of fear, anxiety or dread. The NT uses convey the idea of godly fear, reverence, reverent regard, reverent submission or reverent awe in the presence of God. Eusebeia is a closely related word is similar to eulabeia in reflecting an attitude of one's inner being, but in addition produces an demonstration of that inner attitude in worship. A T Robertson - The image in the word is that of a cautious taking hold and careful and respectful handling: hence piety of a devout and circumspect character, as that of Christ, who in his prayer took account of all things, not only his own desire, but his Father’s will… God was able to save him from death altogether. He did not do this. He was able to sustain him under the anguish of death, and to give him strength to suffer the Father’s will: he was also able to deliver him from death by resurrection: both these he did. It is not impossible that both these may be combined in the statement he was heard. Hebrews 5:7 (note) In the days of His flesh, He offered up both prayers and supplications with loud crying and tears to the One able to save Him from death, and He was heard because of His piety. Joshua 22:24 "But truly we have done this out of concern (eulabeia), for a reason, saying, 'In time to come your sons may say to our sons, "What have you to do with the LORD, the God of Israel? Proverbs 28:14 How blessed is the man who fears (Hebrew = pachad - be in dread, in awe; LXX = eulabeia) always, But he who hardens his heart will fall into calamity. The idea of eulabeia is that of being devoutly submissive. I wonder why my prayers don't seem to be heard so often? Could it be I lack this Philippians 2:5 attitude? And died lest men should perish. So far His love extended. Who linger here in sorrow. Let each befriend the other. Forsake Me?” Hark, the awful cry! Let this hope not be shaken. “’Tis finished!” for Thy work was done. Fulfill with Thine own blessing. O heavenly Father, hear it. Both here below and yonder. Morning and evening - Did this fear (The KJV - "and was heard in that he feared") arise from the infernal suggestion that He was utterly forsaken. There may be sterner trials than this, but surely it is one of the worst to be utterly forsaken? One might say that Jesus' "training for the priesthood" involved suffering, even though he was the Son of God. He certainly did not need to suffer in order to conquer or correct any disobedience. Spurgeon - It is put as if this might have been a case where the rod of the household could have been spared. That there should be suffering for enemies, that there should be sorrow for rebels against God, is natural and proper; but one might have thought that He would have spared His own Son, and that, in His case, there would be no learning of obedience by the things that He suffered. But, according to the text, sonship did not exempt the Lord Jesus Christ from suffering. He learned (3129)(manthano [word study] related to the noun mathetes = disciple, literally a learner [but more just than a learner as explained below]! The shut mind is the end of discipleship!) has the basic meaning of directing one’s mind to something and producing an external effect. Manthano refers to teaching, learning, instructing, and discipling. Manthano means to genuinely understand and accept a teaching, to accept it as true and to apply it in one’s life. It was sometimes used of acquiring a life-long habit. So clearly this verb did not signify just acquisition of "head knowledge" (albeit Bible knowledge is a requirement) but included corresponding life change -- which should be true in all discipleship. As an aside, who are you discipling? If you have been a believer more than 5-10 years (this is not an absolute number - the point is that you have been a believer for sufficient time to have become proficient in the Scriptures and manifest a reasonable degree of growth in grace and knowledge of Christ 2Pe 3:18-note), then you should be actively, intentionally making disciples (I'm not talking about "accountability" groups but about making disciples by inculcating the Word of God [Mt 4:4] and living out the Word, without which NO growth in respect to salvation is possible [1Pe 2:2-note cp Mt 28:20]!) (Mt 28:18, 19, 20 - the actual command [aorist imperative] by Jesus is to "make disciples", 2Ti 2:2-note). Obedience (5218)(hupakoe [word study] from hupó = under + akouo = hear) (see also verb hupakouo) literally means "hearing under", that is, listening from a subordinate position in which compliance with what is said is expected and intended. Spurgeon - Is not that a wonderful thing? As man our Savior had to learn. He was of a teachable spirit, and the Lord Himself instructed him. All God’s children go to school, for it is written, “All your children shall be pupils of Yahweh” (Isa 54:13). The lesson is practical—we learn to obey. Our Lord took kindly to this lesson: He did always the things that pleased the Father. This is our time of schooling and discipline, and we are learning to obey, which is the highest and best lesson of all. How near this brings our Lord to us, that He should be a Son and should have to learn! We go to school to Christ and with Christ, and so we feel His fitness to be our compassionate High Priest… Obedience has to be learned experimentally. If a man is to learn a trade thoroughly, he must be apprenticed to it. A soldier, sitting at home and reading books, will not learn the deadly art of war. He must go to the barracks, and the camp, and the field of battle if he is to win victories and become a veteran. The dry land sailor, who never went even in a boat, would not know much about navigation, study hard as he might; he must go to sea to be a sailor. So obedience is a trade to which a man must be apprenticed until he has learned it, for it is not to be known in any other way. Even our blessed Lord could not have fully learned obedience by the observation in others of such an obedience as He had personally to render, for there was no one from whom He could thus learn. Suffered (3958)(pascho [word study]) means essentially what happens to a person or what they experience. It means to undergo something; to experience a sensation, to experience an impression from an outside source, to undergo an experience (usually difficult) and normally with the implication of physical or psychological suffering. Pascho can refer to experiencing something pleasant, but in the present context (and most NT contexts) it refers to experiencing something trying, distressing or painful. Spurgeon - He was always obedient, but He had to learn experimentally what obedience meant, and He could not learn it by the things that He did; He had to learn it “from what he suffered.” And I believe that there are some of the most sanctified children of God who have been made so, by His grace, through the things that they have suffered. We may not all suffer alike; we may not all need the same kind of suffering; but I question whether any of us can truly learn obedience except by the things that we suffer. God had one Son without sin, but He never had a son without suffering. We may escape the rod if we are not of the family of God, but the true-born child must not, and would not if he might, avoid that chastisement of which all such are partakers. He learned obedience - The definite article ("the" in Greek) modifies obedience which identifies it as a specific or particular obedience which was required of Jesus in the days of His flesh. Vincent - Jesus did not have to learn to obey, see Jn 8:29; but he required the special discipline of a severe human experience as a training for his office as a high priest who could be touched with the feeling of human infirmities. He did not need to be disciplined out of any inclination to disobedience; but, as Alford puts it, “the special course of submission by which he became perfected as our high priest was gone through in time, and was a matter of acquirement and practice.” This is no more strange than His growth in wisdom, Lk 2:52. Growth in experience was an essential part of His humanity. Marcus Dods writes that "it was through painful obedience, not by arrogant ambition he became Priest. The main statement is, He learned obedience and became perfect as Saviour." There is a principle that it is in the school of suffering where we grow the most in obedience. We all know only too well that often the best way to learn sympathy is by having suffered what another is suffering. We can read about the pain of starvation and even see pictures on television of starving children in Africa, but we until we have gone hungry for a period, we cannot completely sympathize with the victims of starvation. Since suffering was the lot of the Son of God, we must never despise it as a tool of the Father's instruction in our lives. If suffering was the lot of our Savior and Lord, His disciples are called to follow in His steps (1Pe 2:21-note); cp 1Cor 11:1, 1Jn 2:6). Scripture does not teach that a dynamic faith will keep us from all suffering and in fact, more often a strong faith is associated with greater suffering! But do not let this deter you from pressing on toward the goal! The prize is eternally worthwhile! Henry Morris explains the obedience of our Lord this way - What Jesus knew by omniscience (Ed: He was fully God), He "learned" by experience (Ed: He was at the same time Fully Man), thus "being made perfect"--not as God (for as God He was eternally perfect, by definition), but as Man. In short, Jesus learned the full meaning of the cost of obedience from the things which He suffered, and God therefore affirmed Him as the completely obedient, perfect High Priest, suitable to be the perfect offering and to be the very one to make that offering! In regard to practical application, we as weak men and women need that "genre" of High Priest weak, One Who knows and understands what we are going through (cp Heb 2:18). William Barclay make a good point writing that "God speaks to men in many experiences of life, and not least in those which try their hearts and souls. But we can hear his voice only when we accept in reverence what comes to us (Ed: cf James 1:2, 1Thes 5:18, Php 4:11,12). If we accept it with resentment, the rebellious cries of our own heart make us deaf to the voice of God. Steven Cole draws several lessons from this section of Hebrews. For example, on suffering to be expected "God’s love for us does not preclude His taking us through great trials. The Father loved the Son, and yet the cross was His destiny. He loves us, and yet brings us to glory through many sufferings. John Piper - No one ever said that they learned their deepest lessons of life, or had their sweetest encounters with God, on the sunny days. People go deep with God when the drought comes (Don't Waste Your Life - download the book free). Never interpret God’s love by your circumstances; but always interpret your circumstances by His love (Miscellaneous Writings [Loizeaux Brothers], He 6:17, 18, “Bethany”). <> Feeling deep emotions during trials is not wrong, but we must submit our emotions to the will of God. The often-repeated comment, “Emotions aren’t right or wrong; emotions just are” has a grain of truth in it, but a lot of error. The truth is, don’t deny the emotions that you are experiencing. The error is, your emotions may be acceptable in God’s sight, or they may be sinful. Grief in a time of loss is acceptable. Railing at God or being bitter towards Him is sinful. Though God strip us of everything, as He did with Job, we should through our tears say with Job, “The Lord gave and the Lord has taken away. Blessed be the name of the Lord” (Job 1:21). <> Even as God answered Christ’s prayers for deliverance through death and resurrection, so He sometimes answers our prayers in ways that seem contradictory to our request. Some say that we are not praying in faith if we pray, “Lord, Your will be done.” They say that we must be bold to ask God for what we want and claim it by faith. It seems, though, that Jesus didn’t understand this principle. He prayed, “Father, if You are willing, remove this cup from Me; yet not My will, but Yours be done” (Luke 22:42). God answered Jesus’ prayer by sustaining Him through the cross and into the resurrection and ascension. He may not answer our requests exactly as we pray. Often “we do not know how to pray as we should, but the Spirit Himself intercedes for us with groanings too deep for words” (Ro 8:26). Are you Suffering? Be Encouraged - We are told that the Captain of our salvation was made perfect through suffering (He 2:10KJV-note), therefore we who are sinful, and who are far from being perfect, must not wonder if we are called to pass through suffering too. Shall the Head be crowned with thorns, and shall the other members of the body be rocked upon the dainty lap of ease? Must Christ pass through seas of his Own blood to win the crown, and are we to walk to heaven dry shod in silver slippers? No, our Master’s experience teaches us that suffering is necessary, and the true-born child of God must not, would not, escape it if he might. But there is one very comforting thought in the fact of Christ’s being made perfect through suffering- It is, that He can have complete sympathy with us. Believer, lay hold of this thought in all times of agony. Let the thought of Jesus strengthen you as you follow in His steps (1Pe 2:21-note). Find a sweet support in His sympathy; and remember that, to suffer is an honourable thing—to suffer for Christ is glory (Mt 5:10, 11, 12-notes). The apostles rejoiced that they were counted worthy to do this (Acts 5:41). Just so far as the Lord shall give us grace to suffer for Christ (2Cor 12:9-note), to suffer with Christ, just so far does He honour us. The Upside Of Sorrow - Sorrow can be good for the soul. It can uncover hidden depths in ourselves and in God. Sorrow causes us to think earnestly about ourselves. It makes us ponder our motives, our intentions, our interests. We get to know ourselves as never before. Sorrow also helps us to see God as we've never seen Him. Job said, out of his terrible grief, "I have heard of You by the hearing of the ear, but now my eye sees You" (Job 42:5). Jesus, the perfect man, is described as "a man of sorrows," intimately acquainted with grief (Isaiah 53:3). It is hard to fathom, but even the incarnate Son of God learned and grew through the heartaches He suffered (Hebrews 5:8). As we think about His sorrow and His concern for our sorrow, we gain a better appreciation for what God is trying to accomplish in us through the grief we bear. Are valuable lessons of grace. —Anon. We can learn more from sorrow than from laughter. Getting In Shape - A woman went to a diet center to lose weight. The director took her to a full-length mirror. On it he outlined a figure and told her, "This is what I want you to look like at the end of the program." Days of intense dieting and exercise followed, and every week the woman would stand in front of the mirror, discouraged because her bulging outline didn't fit the director's ideal. But she kept at it, and finally one day she conformed to the image she longed for. Putting ourselves next to Christ's perfect character reveals how "out of shape" we are. To be transformed into His image does not mean we attain sinless perfection; it means that we become complete and mature. God often works through suffering to bring this about (Jas 1:2-note, Jas 1:3, 4-note). Sometimes He uses the painful results of our sins. At other times, our difficulties may not be caused by a specific sin, yet we undergo the painful process of learning to obey our Father's will. Are you hurting? Perhaps a shaping-up process is in progress. Jesus was perfect, yet He had to learn obedience through the things He suffered (He 5:8). The difficulties of life are to make us better-not bitter. Not to be mentioned, but with shouts of praise." The pardon of a believer's sins is an entire pardon. It is the full pardon of all his sins. It was no pardon to him if it were not an entire pardon. If it were but a partial blotting out of the thick cloud-if it were but a partial canceling of the bond-if it were but a forgiveness of some sins only, then the gospel were no glad tidings to his soul. The law of God had brought him in guilty of an entire violation. The justice of God demands a satisfaction equal to the enormity of the sins committed, and of the guilt incurred. The Holy Spirit has convinced him of his utter helplessness, his entire bankruptcy. What rapture would kindle in his bosom at the announcement of a partial atonement-of a half Savior-of a part payment of the debt? Not one throb of joyous sensation would it produce. On the contrary, this very mockery of his woe would but deepen the anguish of his spirit. But go to the soul, weary and heavy-laden with sin, mourning over its vileness, its helplessness, and proclaim the Gospel. Tell him that the atonement which Jesus offered on Calvary was a full satisfaction for his sins;-that all his sins were borne and blotted out in that awful moment;-that the bond which Divine justice held against the sinner was fully cancelled by the obedience and sufferings of Christ, and that, appeased and satisfied, God was "ready to pardon." How beautiful will be the feet that convey to him tidings so transporting as this! And are not these statements perfectly accordant with the declarations of God's own word? Let us ascertain. What was the ark symbolical of, alluded to by the apostle, in the ninth chapter of his Epistle to the Hebrews, which contained the manna, Aaron's rod, and the tables of the covenant, over which stood the cherubim of glory shadowing the mercy-seat? What, but the entire covering of sin? For, as the covering of the ark did hide the law and testimony, so did the Lord Jesus Christ hide the sins of His chosen, covenant people-not from the eye of God's omniscience, but from the eye of the law. They stand legally acquitted. So entire was the work of Jesus, so infinite and satisfactory His obedience, the law of God pronounces them acquitted, and can never bring them into condemnation. "There is therefore now no condemnation to those who are in Christ Jesus; who walk not after the flesh, but after the Spirit." "Who is he that condemns? It is Christ that died, yes rather, that is risen again who is even at the right hand of God, who also makes intercession for us."